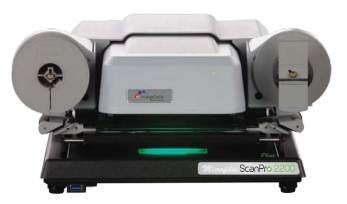 The ScanPro 2200 Plus provides high performance and value. Leading universities, libraries and private companies around the world choose the e-ImageData ScanPro for it’s proven track record of performance, ease-of-use reliability and value. There are thousands of ScanPro microfilm scanners in constant use. It is not uncommon for users to report that millions of scans have been made and the scanners are working like new. Kodak technical service has commented that our scanners are one of the best microfilm scanners that they have ever sold. Fast, powerful and easy-to-use software. The ScanPro 2200Plus software is an intuitive Windows® computer application with familiar icons and text labels to further reduce the learning curve for both occasional and first time users. And, just CLICK the Film Selection Wizard to automatically set up your scanner for any microform application. One CLICK on-screen buttons complete look ups and research quickly and efficiently. Also, there is an on-screen help menu at your fingertips that provides details on how to use any button control. FOCUS-Lock™ provides continual automatic focus. Constant focus is an exclusive feature found only on ScanPro microfilm scanners. That feature maintains image focus throught optical zoom at all times. That results in the ScanPro always being ready to be used for making looks ups and completing research easier, faster and more efficiently. Scanners without FOCUS-Lock go out of focus immediately when optical zoom is used making them both difficult to use and time consuming to operate. This provides an unpresidented capability to read small text and view fine details on your microfilm. Only the ScanPro microfilm scanners have this capability. OCR for features and automatic-scanning for microfilm. The e-ImageData OCR features are revolutionizing the way researchers, genealogists, librarians and patrons use microfilm. These OCR features are bundled together as the PowerScan Productivity Suite and work with the microfilm image that you see on the view screen. This optional OCR software consists of WORD-Search, INFO-Link, copy selected areas as text to your “clipboard”, and creates word searchable PDF’s. And, automatic-scanning, standard on the ScanPro 2200Plus, lets you scan selected images or the entire roll. Or, you can add the optional AUTO-Scan® Pro for high speed scanning of selected images or the entire roll. Find words right on your microfilm image without having to read through the entire page. Just enter the word that you are looking for in the search box and if it is on the microfilm, it will be highlighted every where it appears. Use INFO-Link to get more information about what you see on your microfilm. Just click to highlight a word or words and then select the internet reference source that you want to use like Wikipedia, a thesaurus, or a dictionary. Select information that you see on your microfilm image and copy it to the clipboard as editable text for pasting into any document or presentation. With a single click you can convert any microfilm image to a single page word searchable PDF or multi-page word searchable PDF.